Dull blades are less effective and tend to "pull" rather than cut. NOTE: The tasks and timings shown here for your Electric Shaver are based on a single-family home (owned), located in Massachusetts, United States, with priority set at ‘1 star' or higher, for all possible goals. If you set your personalization differently in your Home Wizard app, then you may get reminders for different tasks and timings in your recommended home care program for your Electric Shaver. Replacement heads (blades) can be purchased from specialty stores in many shopping malls, or from some manufacturers. If you don't have the instructions on how to replace your shaver's heads (blades), a store clerk or the manufacturer's website may be of assistance. When replacing the head (blades), inspect the comb or foil (which houses the blades) for any dents or nicks which can dull the blades; replace as necessary. Also use the shaver brush to clean the cutting area before replacing the head (blades). The benefits of this task are moderate. Depending on the age of your electric shaver and the cost of replacement blades, you may actually even find that it is more cost effective to purchase a new electric shaver instead. The cost of this task is very low. It is estimated that this task should only take about 30 minutes to complete, and the task is relatively easy to do. 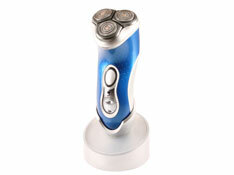 No specialized tools are required, although you will need to purchase the appropriate blades for your electric shaver.